U.S. Senator Elizabeth Warren of Massachusetts at a rally in support of Kentucky democratic candidate Alison Lundergan Grimes at the University of Louisville in Louisville, Kentucky. Elizabeth Warren probably isn’t going to run for or win the Democratic nomination for president in 2016, but that hasn’t stopped progressives from trying to get her to run. And it’s no wonder: Warren would be among the most liberal presidential candidates — if not the most liberal — in the modern era (since 1972, when Democrats began selecting their nominee through the caucus and primary process). Quantifying the ideology of politicians is tricky, but we’ll use a method similar to FiveThirtyEight’s presidential forecasting model by looking at each nominee’s congressional voting record, fundraising and public statements (Adam Bonica’s ideological scores based on a candidate’s donors, joint DW-Nominate scores based on a candidate’s voting record in Congress, and On the Issues scores based on public statements). In all cases, negative scores mean more liberal. We usually standardize and average these three metrics, but there aren’t scores for all the candidates before 2000 and comparing across time can be tricky. So let’s keep this simple and just look at each metric separately. The logic behind Bonica’s fundraising scores goes basically like this: If liberals are giving you lots of money, you’re probably pretty liberal, and if conservatives are filling your coffers, well … you get it. 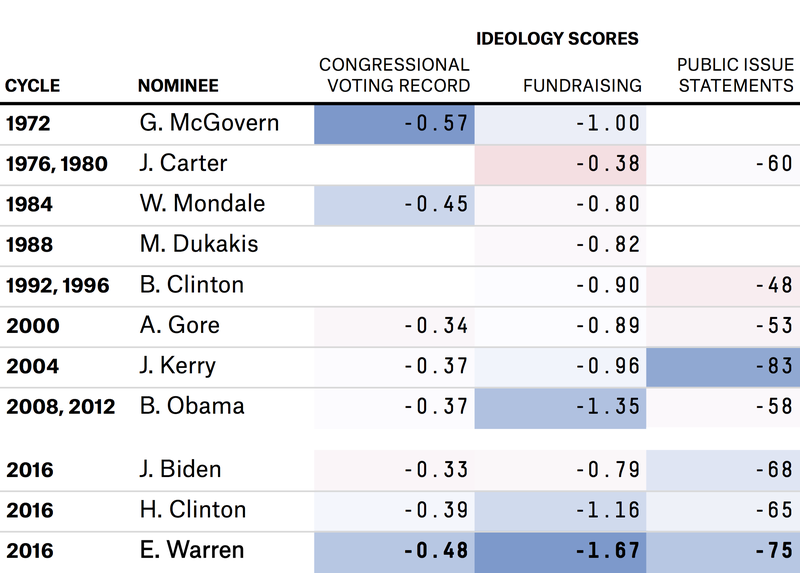 According to Bonica’s scores — the only system of the three for which we have grades for all the candidates — Warren would be by far the most liberal nominee in the modern era. Indeed, fellow Democrats have sought her help on the campaign trail in large part because of her appeal among liberal donors. It’s also no surprise that those at Netroots Nation have taken a shine to her. If Warren were to win the Democratic nomination, she’d rank as the second-most liberal nominee who served in the Senate or House. Her voting record has been to the left of Walter Mondale’s; only the famously liberal George McGovern had a more leftward-leaning legislative record. By contrast, the past three Democrats to represent the party on the presidential ticket were all near the center of the Democratic Senate caucus, while Warren has the fifth-most liberal voting record in the Senate today. On public statements, Warren ranks a clear second. The only past nominee to her left, according to On the Issues, is John Kerry. But the distance between Warren and Kerry is smaller than the distance between Warren and any other past nominee. In other words, Warren’s liberalness on this measure is pretty clear — far to the left of President Obama. In terms of 2016 contenders, Warren is to the left of both Vice President Joe Biden and former secretary of state Hillary Clinton on all three of these measures. But it’s not like Biden and Clinton aren’t liberal. Clinton especially has a fairly liberal donor base by historical standards. Clinton would be to the left of the median senator (-0.33) in terms of voting record. Clinton, like Biden and Warren, would be the second-most liberal nominee in the modern era in terms of public statements. And therein lies Warren’s problem. The clamoring for Warren to run in 2016 doesn’t go much beyond the progressive wing of the Democratic Party. Warren may be the most liberal, but the other top 2016 contenders haven’t left a lot of room on the ideological left for her to gain a foothold.